If I lived in Fort Myers, I'd be here often, trying something different to eat, and sampling the ever changing live music entertainment. The people at two nearby tables were regulars, dining and enjoying the performers, such as The Samples, during their weekly visits. The parking lot had a Harley, an older Chevy and a new Beemer-a diverse clientele who appreciate the unique food and music offered in this postage stamp- sized treasure. Yes, it's a refreshing change for the area, well supported by the dining and the entertainment aficionados, being packed every weekend night during the season-not hard in a 40 seater. The decor is simple, dark as in romantic, dark as in how a coffeehouse must have been in the 50's and 60's, and so acoustically friendly that it's been used as a recording studio. Sean Wood masterfully covers the front of the house-knowledgeable about the food and wine pairings, and silently delivers food so as not to disturb the diners or performers. Chef Ryan Kida, a well respected musician, cooks hearty flavorful Italian food, not bland American-Italian, and the richness of his sauces, the proper cooking of the meats, seafood and the crispy veggies attests to his love and mastery of the cuisine. The menu is compact, prices very reasonable. 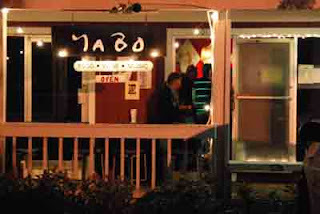 Yabo's serves big portions with big taste. Sample the 3 salads- I had luscious chunks of cheese in the Gorgonzola Salad ($8) There are some 4 pastas, with people raving about the Lasagna Bolognese ($16) and Linguine Vongole ($20). I tried the Calamari Livornese appetizer ($12) -a generous portion of exquisitely tender calamari in a rich mildly spicy red sauce-I used a whole basket of the delicous bread, to soak up every morsel of the sauce and calamari. 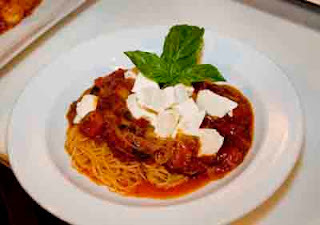 There are 6 entrees, with raves about the large Eggplant Parmesan portions of layered fresh basil, ricotta & mozzarella ($16). 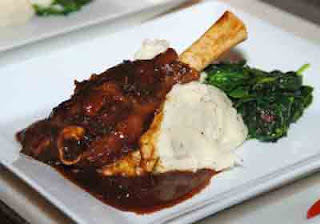 I had the melt-in-your-mouth lamb shank, with it's sauces' thick multidimensional layers of flavors, and told Sean "You don't even need teeth to enjoy this, it's so tender". 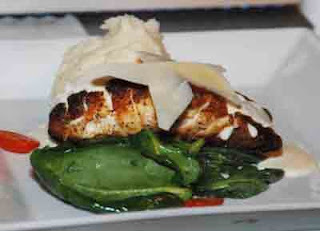 The Scallopini Marsala ($25) was popular, as well as a blackened grouper special, served over spinach. Throughout the night, I was lucky to have performing songwriter Terry Lynn Conrads sing her own songs with amplified acoustic guitar- the enthusiasm of her followers was contagious. 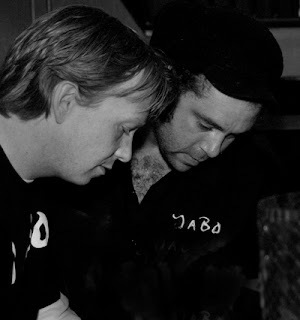 Yabo's varied musicians are a bonus to the dinners. 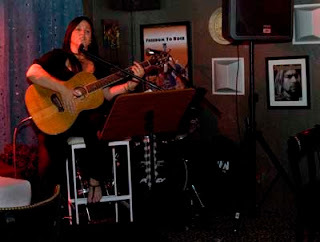 The live music entertainment is lighter 6-9 pm during dinnertime, with rock and contemporary from 10 pm onward, esp. on Fri and Sat nites. Call/Check the myspace.com/yaborestaurant website for current entertainers. I continue to read and enjoy your stories, keep up the good work. I was wondering if you could put a link to MenuVenueSWFL.com on you links section? Could help your readers find more information about the restaurants you are writing about. Thank you and feel free to email me if you have any questions. 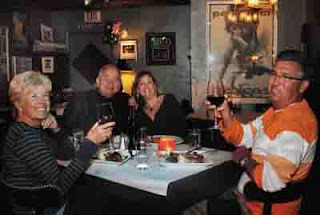 Let's get a group of people, and check out some restaurants-be fun to put together out different perspectives. HI, Appreciate the note that things don't look equally good across different browser formats. I test on Firefox and on internet explorer before I post...beyond that, I am an internet dummy as to figuring out any other fixes. I'm open to suggestions. Thank you!